The latest audio lineup from Panasonic epitomises the company’s philosophy of creating high-quality experiences that everyone can enjoy. 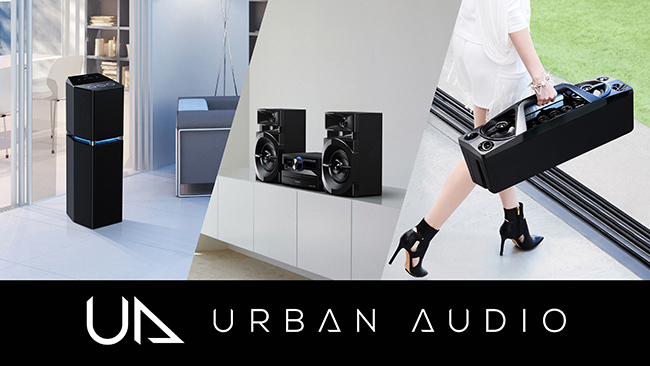 The company’s new Soundbars, Urban Audio, Micro and portable systems are designed for clear, dynamic sound, and every model in the range provides wireless Bluetooth® capabilities- so users can enjoy listening to music from their favourite sources around the home at the touch of a button. Panasonic has unveiled two new Soundbars – the SC-HTB688 and SC-HTB488 – designed to fill the room with clear, rich and rounded sound, which is stronger and more immersive than standard TV speakers can deliver. Panasonic’s years of experience in audio technology and speaker design is reflected in the new devices, allowing you to get the most out of any audio source. The Soundbars connect to the subwoofer via a wireless connection, for an optimised, cinema-like sound to enhance your viewing experience. Bluetooth® wireless technology is also integrated to enjoy music from a smartphone or tablet. Whether you’re using your tablet to hear internet radio or a smartphone to listen to your favourite music or podcasts, the new Soundbars are ready to be paired with any Bluetooth device. 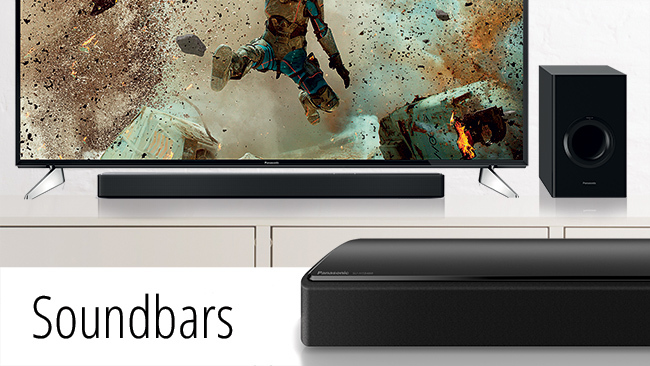 When combined with a Panasonic TV, the new Soundbars are the perfect addition to create a sense of having your own cinema at home. Their compact design allows for a clutter-free living space, regardless of whether a TV is wall-mounted or free-standing. If the TV is free-standing, the Soundbars fit neatly beneath it without obscuring the view thanks to their slim and stylish profile. The SC-HTB688 offers 300W total output power and 3.1 channels, while the SC-HTB488 offers 200W and 2.1 channels. Both bars support HDMI with Audio Return Channel (ARC) and optical connections. The speakers have been designed for clear, high-fidelity music playback. Panasonic has introduced three models in a new range of ‘urban audio’ products which provide a stylish twist on the standard mini system and feature Bluetooth for easy music streaming. The Urban Audio SC-UA7 is a freestanding one-box speaker with a distinctive hexagonal design that packs a ground-shaking 1,700W of power output, making it perfect for parties and home entertainment. The SC-UA3 boasts a powerful amplifier, producing expansive sound in a stylish compact body designed for benchtops or shelves. The system allows users to play music from a variety of sources, including Bluetooth, USB, CD and radio. The SC-UX100 is a compact mini system that delivers strong bass and clear room-filling sound. Its luxe design looks great in any room, while Bluetooth and DJ Jukebox features make it the life of every party. The 2.1 channel Urban Audio SC-UA7 combines its unique design with phenomenal power and performance, all in a single box. Whether you’re enjoying an action-packed movie or it’s your turn to select a dancefloor-filler on the SC-UA7’s sleek touch display, the robust bass can turn a good audio experience into an unforgettable one. The SC-UA7’s 1,700W of power is complemented by a unique Airquake Bass configuration that can be physically felt when near to the speaker. Four small ports pull sound forward from the dual woofers, preventing air from escaping to create an extremely powerful sound. In addition to great bass performance, the SC-UA7’s midrange woofers and tweeters are positioned across three sides of the box for a 180-degree sound range that fills every corner of a room. In total, the all-in-one speaker boasts 10 separate speaker units – two 16cm woofers, four 8cm midrange woofers and four 6cm tweeters. The SC-UA7 also offers simple operation and a range of playback options. Bluetooth functionality means you can stream all your favourite tunes directly from a mobile device, while the Panasonic Max Juke app allows you to compile playlists and perform operations such as volume, play, pause and EQ settings. The system also includes two USB ports for music sharing and playback, as well as enough internal memory to store around 1,000 songs. Additionally, if you want to use the speakers for home entertainment, an optical input ensures simple connectivity with a TV. The feature-packed SC-UA3 delivers 300W in a sleek, compact design, complete with a handle so it’s easy to move it from room to room. The all-in-one design of the SC-UA3 provides dynamic sound and multimedia capabilities with Bluetooth connectivity and a USB port for linking to audio from a smartphone, tablet or other device, allowing the user to be in complete control. The versatile system also offers a CD player, FM radio and ‘Jukebox Request’ functionality so the music never has to stop. In addition to aligning the woofers and tweeters, Panasonic has added two more tweeters at the corners so that the SC-UA3 delivers music equally over a wider area. Outward and forward-facing tweeters are found on both the left and right sides, whereas the angle of the four tweeters and Aerodynamic Port (on the left and right), are aligned to offer better sound pressure levels compared to conventional models. The SC-UA3’s compact horizontal design has a matte finish on the sides, creating a beautiful contrast with the hairline edge of the upper section. The central buttons are backlit and the line running along the distinctively-designed handle is also illuminated. These blue lights break up the black surface, adding to the urban design feel. The SC-UX100 makes a stylish addition to any home with its premium, compact design enhanced by a matte black finish with gloss accents and an adjustable illumination feature. Wireless Audio with Bluetooth is incorporated so you can stream your favourite tunes to the SC-UX100 from your smartphone or tablet. The DJ Jukebox plays songs from a USB device with Mix Play mode, and with Panasonic’s original MAX Juke App, users can operate playlists and play requests to add even more fun to parties. With 300W output power, the newly-designed speaker achieves bass sound with plenty of punch and well-balanced sound overall. The speaker units use a 13cm woofer and 5cm tweeter that are optimised for its 2-way system. The front surface of the woofer unit is enlarged, and the front aperture of the tweeter is shaped to emit a wider, more expansive sound. Panasonic’s latest micro systems offer users a choice of design, as well as excellent sound quality. 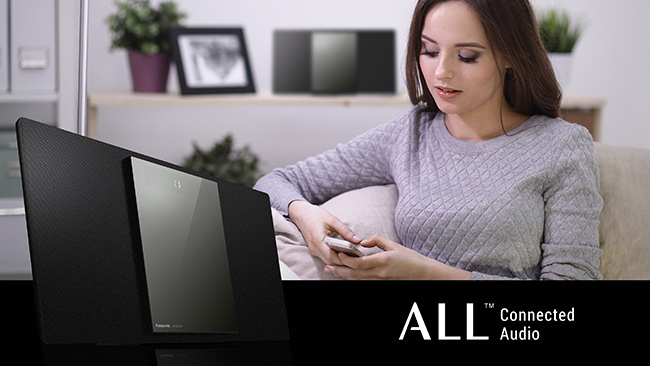 The SC-PMX152 and SC-HC1020 are designed for music streaming with AllPlay™ compatibility. Panasonic’s SC-PMX152 and SC-PMX82 are compact bookshelf systems with audio capabilities that further improve sound quality, designed to meet the needs of today’s increasingly popular high-resolution sound sources. The SC-HC1020 in stylish black is an all-in-one music streaming system that can be wall-mounted or placed on a desk or bedside table. The SC-HC397 is also wall-mountable and available in silver. With top-quality audio components, 3-way speaker systems, and sleek dimensions finished with a compact design, the SC-PMX152 and SC-PMX82 not only look great but deliver the best audio experience to quality-orientated music lovers. The SC-PMX152 is Panasonic’s latest addition to its ALL Connected range, which frees the listening experience, so that users can enjoy online music services, digital collections, CDs, radio and more, all over the home. With this model, users can access their favourite internet radio stations from six presets accessible from the main unit or the remote. The intuitive operation of the Panasonic Music Streaming App lets anyone quickly and easily control ALL Connected Audio in various rooms, using an existing WiFi network. In addition, the app can be used to easily control Bluetooth® music streaming, CD playback, radio and USB re-streaming, as well as providing links to Spotify and ALLPlay radio powered by TuneIn. For instance, CD re-streaming enables the user to listen to their music collection anywhere in the house. Both models offer Bluetooth Re-Master, which compensates for any audio signals that are lost due to data compression when streaming Bluetooth. This feature provides high-quality playback of sound sources from Bluetooth-compatible devices such as smartphones and tablets. Panasonic is driving innovation with the SC-PMX152’s CD High-Res Re-Master function which provides high-quality sound from various sources – including CDs, MP3s and smartphones. By delivering high-frequency sounds of 20kHz or more, far beyond ordinary CD playback, MP3 Re-Master compensates for any lost audio signals that exceed the audible range. Via DSP processing, distorted components of the high frequency are replaced by harmonic signal components with less distortion. To ensure authentic and impressive sound, both devices are equipped with Panasonic’s innovative new 3rd-generation LincsD-Amp solution. This delivers a more refined, pristine sound as it corrects issues such as jitter and unwanted distortion in digital music playback. Additionally the Variable Gain technology enhances clarity at low volumes. Panasonic continues to evolve its high-performance 3-way speaker system to ensure the most from both models’ updated amp technology and 120W power output. By combining this 3-way design with a Super Sonic Tweeter, the SC-PMX152’s speakers are capable of reaching the ultra-high 100kHz frequency range. This ensures that the speaker is able to produce beautifully dynamic sound packed with the sort of tiny details that bring high quality recordings to life. Premium aluminium material is used on the front panel of both models. For added sleekness, an extra aluminium top panel is included on the SC-PMX152’s main unit. Both systems combine compact size, high grade design and an elegant finish, complementing a wide range of room décor. 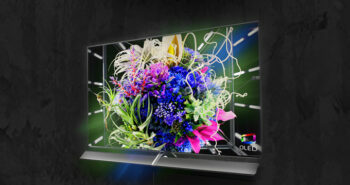 The SC-HC1020 houses high-quality performance in a sleek wall-mountable design. The speakers have a new fabric mesh material and mirrored front panel, a design that harmonises with any space and offers a warm modern feel. Its sound mode delivers a wider sound field with outstanding clarity. Like the SC-PMX152, the SC-HC1020 is part of Panasonic’s lineup of ALL Connected audio products. It can re-stream CD, Radio and USB content to other ALL Connected devices; as well as supporting music streaming services such as Spotify and AllPlay Radio powered by Tunein. Users can access their favourite internet radio stations at a touch of one of the five pre-set buttons. Enjoy rich and robust bass and experience music exactly as it was meant to be heard thanks to the 3rd generation LincsD-Amp. The latest version of this technology corrects issues such as jitter and power supply noise that usually cause distortion in digital music playback. The speaker position has been moved higher on the device, to limit obstacles and create a clear reverberation when the speaker is wall-mounted. This creates a wider sound field for an optimal room-filling sound. The wall-mount mode also optimises the sound with digital signal processing and suitable EQ settings measured against the baffle effect of the rear wall. The SC-HC1020 has 40W power output, with two speakers that adopt the Twisted Acoustic Port, a unique shape designed for increasing resonance. The slim SC-HC397, available in silver, offers convenient wall mounting, DAB+ radio, CD playback and 40W power. 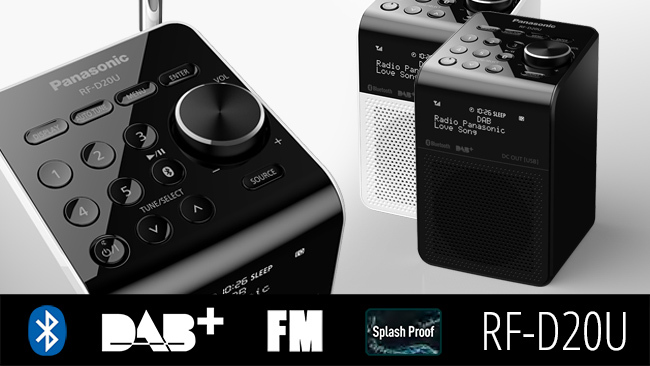 The RF-D20U is a compact, splash-proof radio with a vertical design, available in a choice of either two tone black and white, or sleek black. In addition to DAB/DAB+/FM Radio, this all in one model supports Bluetooth so you can stream your smartphone music wirelessly. A USB port allows smartphone charging. The splash-proof design is IPX3 rated, ideal for use from the kitchen to the outdoors, so you can hear your favourite sounds wherever you please. The radio operates on AC power or AA batteries. Other handy features include 5-channel memory, clock and alarm and an easy to read LCD display with white backlighting. 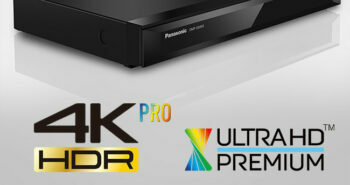 For more information, please contact Panasonic on 132 600 or visit www.panasonic.com.au.